The Edmonton Eskimos announced Monday they've re-signed receiver Vidal Hazelton ahead of the upcoming season. Hazelton joined the Eskimos practice roster midway through last season after being cut by the Toronto Argonauts. 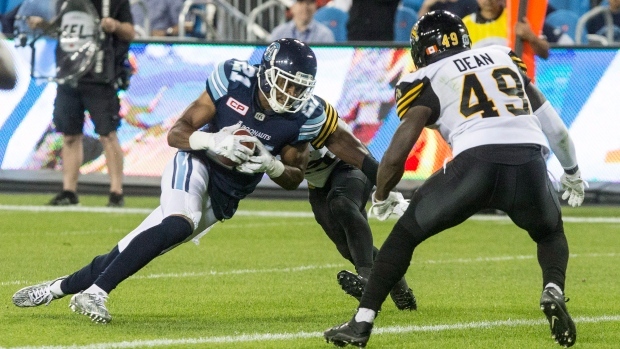 In eight games with the Argos last season, the 28-year-old had 27 receptions for 361 yards and three touchdowns. Hazelton had an impressive rookie season in Toronto in 2015, finishing with 70 receptions for 803 yards and six touchdowns in 16 games. For his efforts Hazelton was named the East Division's nominee for Most Outstanding Rookie in 2015.